...and yet, BULLS not trampling the bears! Is it too good to be real? 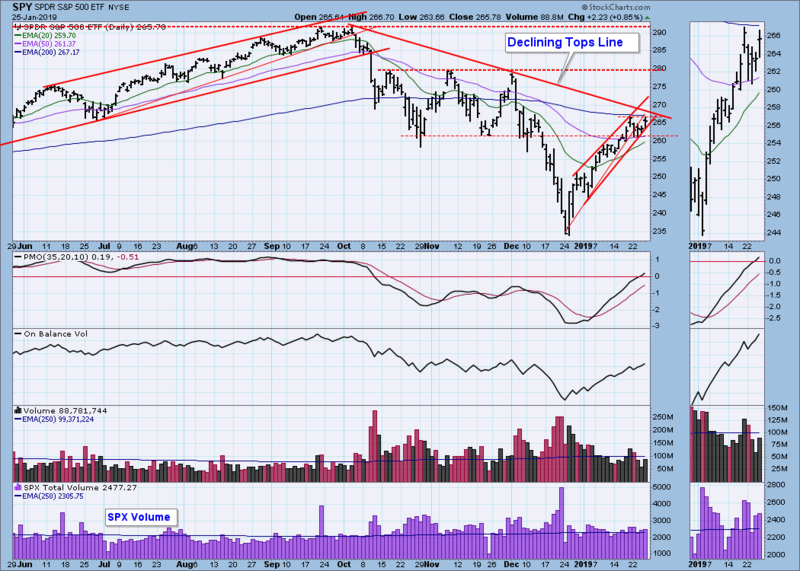 However, earnings season continues and it appears as if this is the key factor restraining the bulls. SP 200ma is the major resistance and 50ma is the major support. there are more good news during the week. "We expect the S&P to take out the recent high at 2675.47 and then set its sight on 2710-2720, which is the zip code of a yuuuge Fibo level and the 100-day moving average. Probably the place to sell but will revisit when we get there. This, of course, assumes no rupture in China trade talks. On the downside, the big, big, big number is last week’s low of 2612.86, which is now the 50-day moving average. Huge week for earnings and China trade. That’s our short-term view, folks, and, as always, we reserve the right to be wrong, which we often are. All of us have no idea of the future and are driving in the fog. We can only use our imprecise instruments to guide us. Happy hunting next week, folks." Edited by dTraderB, 27 January 2019 - 09:11 PM. The rally on Friday was based on the Fed will turn exceedingly "dovish" in a meeting next week. This could well wind up disappointing the markets. Last week, we added equity exposure to our portfolios with the acquisition of some companies that we like the fundamentals of.However, we also swept a large portion of our trading cash into 1-3 month Treasury bills as the risk/reward for equities remains negative. The Dow Theory is still flashing a "sell" signal. Before this indicator can turn bullish again, the rally that has taken the Dow Jones Industrial Average almost straight up since its Dec. 24 low must end. That's why bullishly predisposed Dow Theorists should be hoping for a market pullback. 1. Both the Dow Jones Industrial Average and the Dow Jones Transportation Average must undergo a "significant" rally after hitting new lows - "significant" both in terms of time and magnitude. 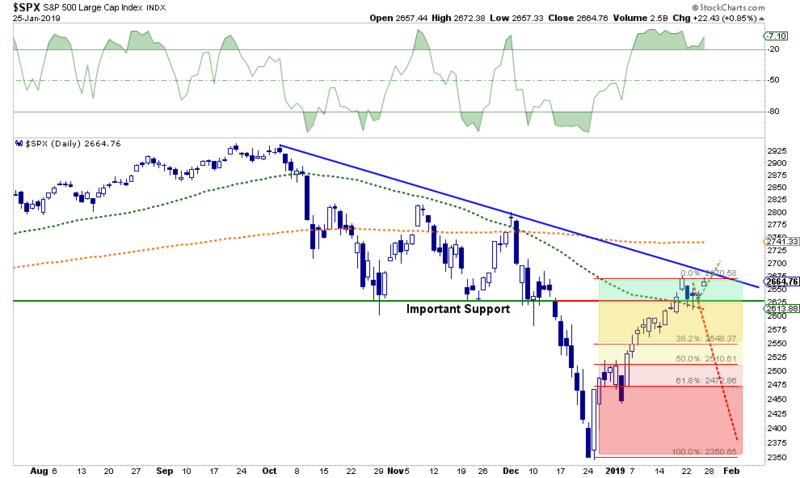 This step has been satisfied by the market's rally from the Dec. 24 lows. 2. Both of these Dow averages must subsequently undergo a "significant" correction of the rally referred to in step #1, and in this correction either one or both of these Dow averages must hold above their previous lows (Dec. 24). We are waiting for this step. One of the lesser-appreciated aspects of this three-step process is that, without a "significant" pullback (step #2), a buy signal will never occur. "Overall, the weight of evidence suggests a retest of support at which time portfolios can be re-evaluated." 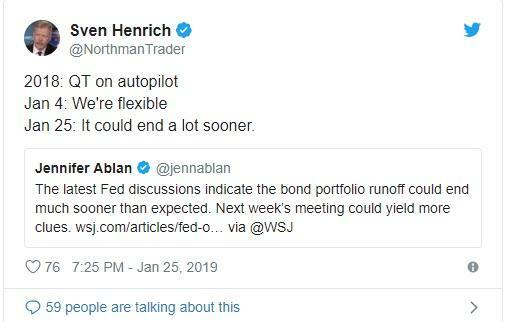 a WSJ article suggesting that the Fed would not only stop hiking interest rates but also cease the balance sheet reduction which has been extracting liquidity from the market. This was quite the change as noted in an early morning tweet. Stocks may be on the brink of another correction. Despite 2019′s strong start, the Economic Cycle Research Institute’s Lakshman Achuthan believes the market remains in a danger zone, because there’s evidence economic growth is still decelerating. Achuthan, an economic forecaster, draws his conclusion from a chart showing S&P 500 Index corrections and slowdowns over the last decade. The shaded areas represent U.S. growth rate cycle downturns. Trump tells WSJ another government shutdown is 'certainly an option' NO, DO NOT! Investors shouldn’t be surprised if markets behave like they did in December, according to J.P. Morgan co-President Daniel Pinto. “Markets will tend to overreact to things, and you have these big moves, and then a correction to rationality,” said Pinto. And, so far, they have botched it. The problem is that, since the 2000s, U.S. long rates have been suppressed by foreign investors. Europeans stuck in a lethargic economy, and Latin Americans and Asians fearful that their corrupt governments will ignite inflation to solve their debt problems, have been buying up U.S. real estate and long bonds. Similarly, the dollar has increasingly become the preferred currency for all global trade, further increasing the demand for U.S. bonds. Those unhinge the relationships between business expectations and interest rates. For example, the yield curve has been sending warning signals since late 2017 but the economy sped up last year instead of slowing. Lacking the Phillips curve and yield curve as tools, Fed Chairman Jerome Powell is flying without an altimeter and air-speed indicator. Not being an economist, he hasn’t been to pilot school either. The best thing . Powell can do for now is pull back on the stick and announce he is not planning any more interest-rate increases until at least this summer.